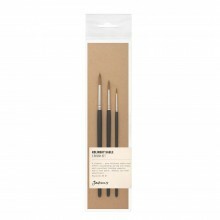 Jackson's Round Akoya brushes maintain their excellent spring and shape and are useful for finer details. Akoya brushes, so named because their pure white silky hairs resemble the Akoya pearl, have been developed to match and build upon qualities offered by the leading natural hog brushes. Colour and liquid absorbency is maximised by craters in each hair that gather pigment and replicate natural hairs in a way that other synthetic brushes are not capable of. In addition to this, the Akoya brushes maintain the excellent spring and shape that one would expect of a synthetic brush, reinforced by the two thicknesses of hair used. These brushes are designed to last, thanks to a heating process that causes the hairs to retain their shape after use, and the strength of the filaments themselves. This durability means that you won't have bristles breaking off in your paint. With slightly stiffer hair than our Procryl brushes, the Akoya exhibits the best characteristics of both the highest grade natural and the finest synthetic brushes. Please note that this synthetic brush does not contain any animal products, either in the varnish, bristles, paint or glue. 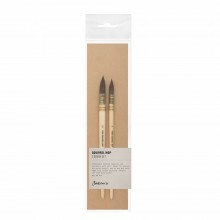 For more information and reviews on Jackson's Ayoka Brushes, click here.